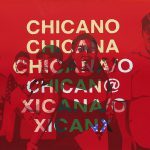 Hence, to reckon with hxstory, or to “take inventory,” as Gloria Anzaldúa calls it, is the first step towards conocimiento/ consciousness.ii She states that one must first take inventory to fully understand the weight one carries on their back, ultimately so to stop blaming victims for the problems generated by years of racism, colonialism, and oppression. These “weights” can be seen through the accounts that the viewer encounters when engaging with Jackson’s prints. The next step that Anzaldúa poses following the “taking of inventory” is a “winnowing out of the lies”, which is necessary to see what is true, so that injustice is not reproduced in actions that seek to generate social justice. Thus, in this journey, this exhibition replaces the i/e in history/herstory with an x to embrace decolonial teachings, as well as to create a space with the “x” for those whose truths and narratives have been left out because of hegemonic, patriarchal and heteronormative oppression. Carlos Jackson’s Reckoning with Hxstory pulls from a variety of influences in his life as a cultural worker. 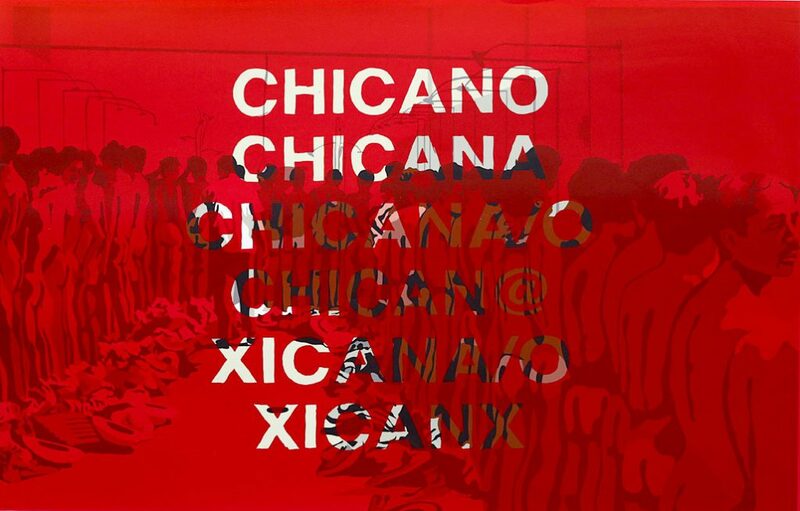 Jackson’s extensive background in Chicanx art can be seen in the content of the work, particularly in creating visuals where consciousness and subjectivity is produced. 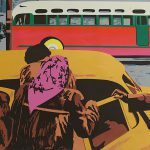 As a printmaker, the influence of Cuban poster artists and graphic designers can be seen in layout choices and color selections. 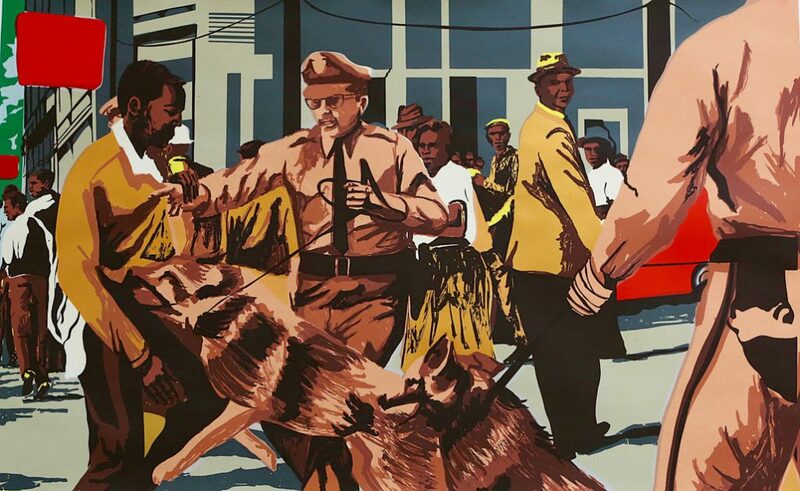 For example, the influence of René Mederos’ screen-print series “vallas”, on the history of the Cuban revolution commemorating the 20th anniversary of the assault on the Moncada, can be seen in Jackson’s use of visual narrative formation and choice in 3’x 4’ prints. 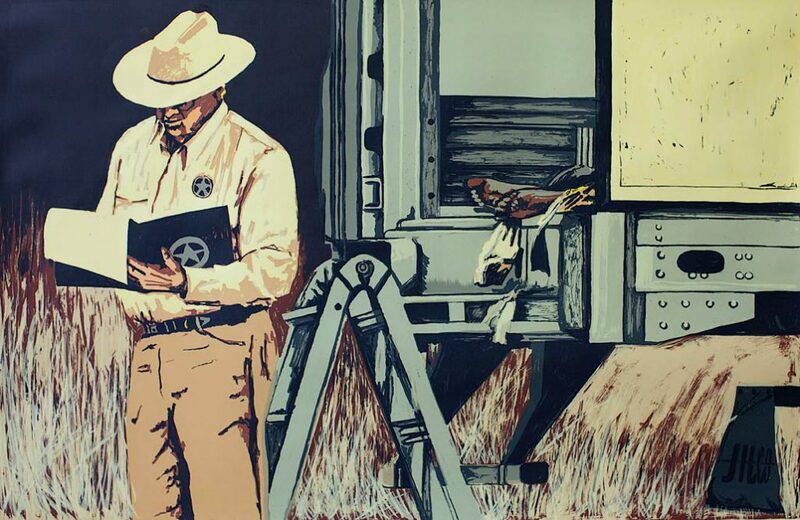 Though his prints are bigger than René Mederos’ prints, they still carry the function of being utilized for public educational use to anyone with or without literacy. 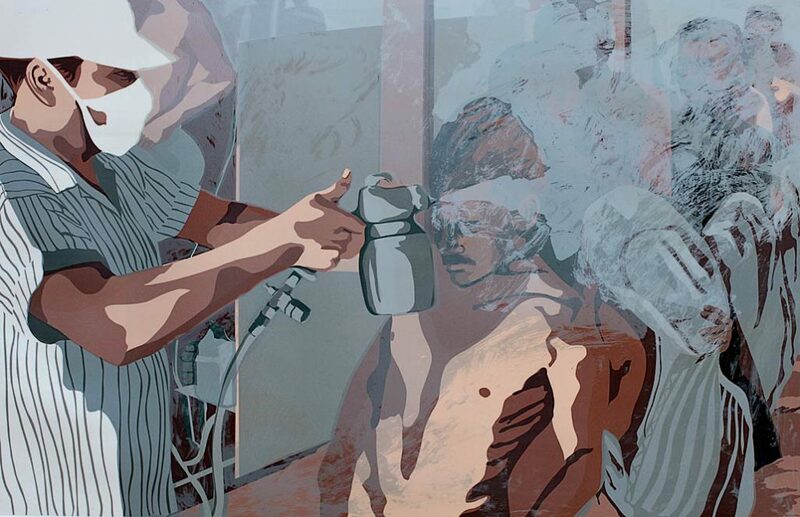 Jackson’s usage of large blocks of color to define shapes and people is similar to that of Mederos, but traces of his training in painting can be seen in the strokes used in the shading and definition of figures in his prints. 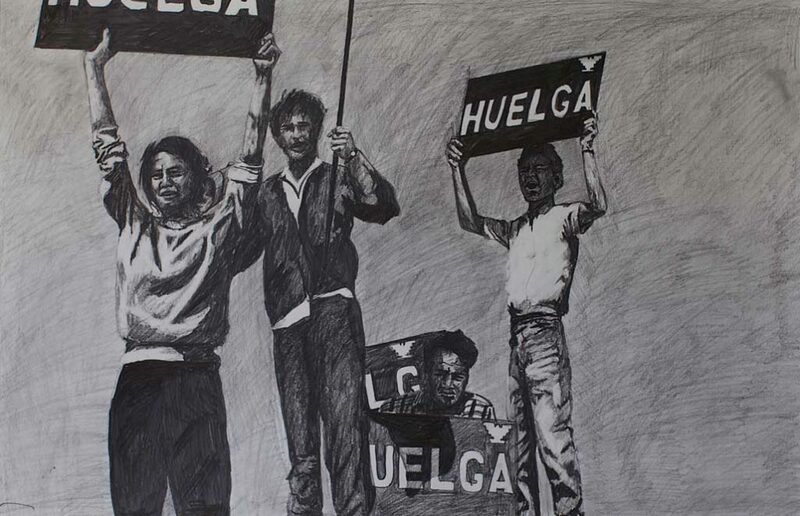 The choice of interconnecting moments through iconic images of liberation movements in the last six decades is part of the larger work that Jackson engages in as a scholar in the Chicanx Studies department of UC Davis, and as Director and founder of Taller Arte del Nuevo Amanecer (TANA), a Chicanx community art center. 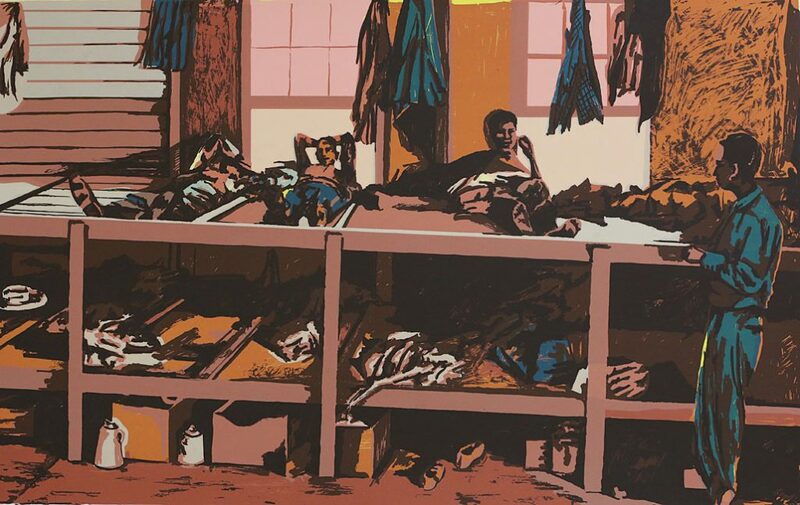 Jackson’s large-scaled prints demand the viewer confront hxstories of fascism, racism and colonialism that Blacks, Chicanxs and other minority groups have endured in U.S. That is to say, the experiences depicted here are a result the settler-colonial project brought into the Americas, where people were seen as less then by their white counterparts due to skin color, hair texture, religion and ancestral backgrounds. 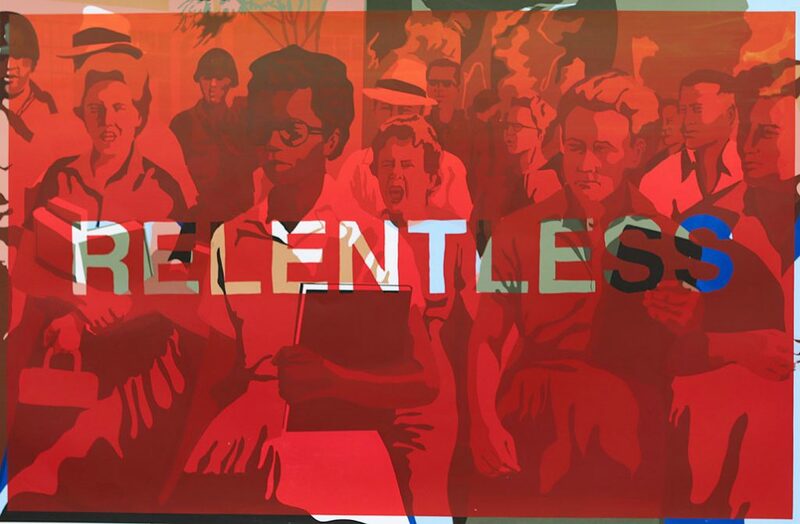 This haunting truth comes to life in his screen-print RELENTLESS/Little Rock 9, where he replicates the fifteen-year-old Elizabeth Eckford attempting to enter Little Rock Central High School on September 4, 1957 following the Supreme Court’s Brown v. Board of Education decisions for integration.iii A furious white mob of roughly 400 gathered around the school that day along with the Arkansas National Guard to refuse these students entry. 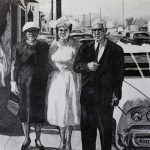 Jackson’s print brings to life the racism thrown at Eckford by white women, it is as if the viewer could hear the echoes of white supremacy ringing in their ears years later. Of course, to the viewer paying attention to the current events happening in the U.S., they will find that the echoes of white supremacy have not died out; the viewer will find a parallel between RELENTLESS/Little Rock 9 and the recent pro-white/alt-right attacks happening throughout the country, most noticeably in Charlottesville, Virginia. This is why it is of importance for the viewer to recognize as Anzaldúa states that “Awareness of your situation must come before inner changes, which in turn come before changes in society,” because “nothing happens in the ‘real’ world unless it first happens in the images in our heads.” iv This point is crucial, especially in a time where news is manipulated into alt-facts that deceive the viewer. 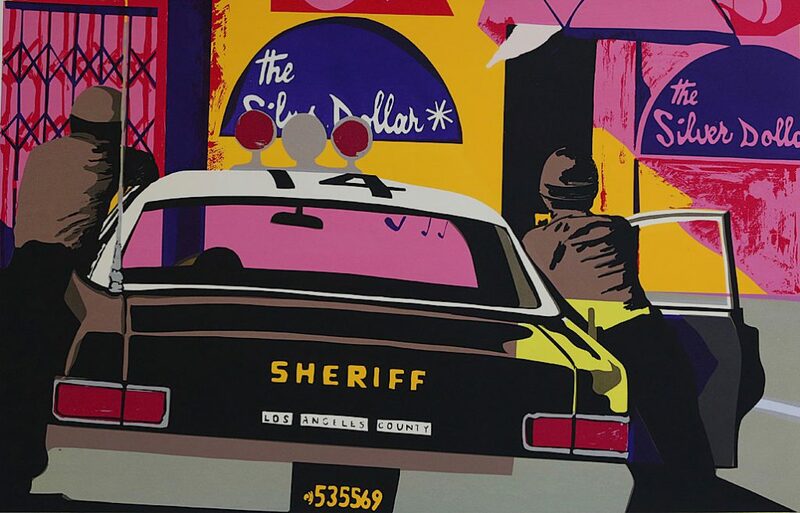 For those that feel overwhelmed and exhausted because they have been aware of the current conditions happening across the U.S., Jackson’s work then offers a reminder of courage, resistance and ruthless and unapologetic motivation to keep going. The image of Eckford walking by the white mob can serve as a motivation in the ability to keep seeking change in America until it becomes the America which embodies a true democracy and gives opportunity to all despite documentation, race, gender and/or body ability. 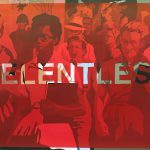 The transparent red gradient with the word “Relentless” which appears over RELENTLESS/Little Rock 9, signals to the viewer that against all odds, people of color have resisted through being relentless and unyielding to white supremacy. 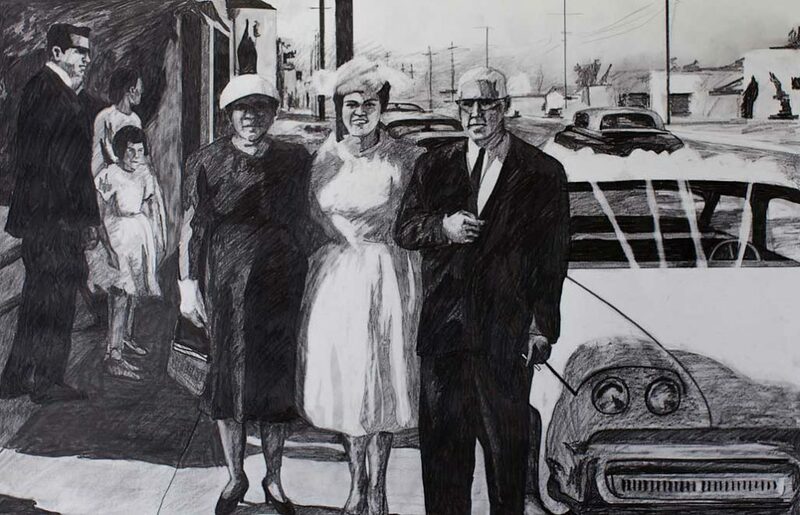 In this print, Eckford is no longer seen as a victim of white supremacy, instead she is someone who relentlessly imagined an alternative future for herself and future generations. Eckford then becomes someone creating a new image of America in her head and paving that path towards self-determination and democracy. 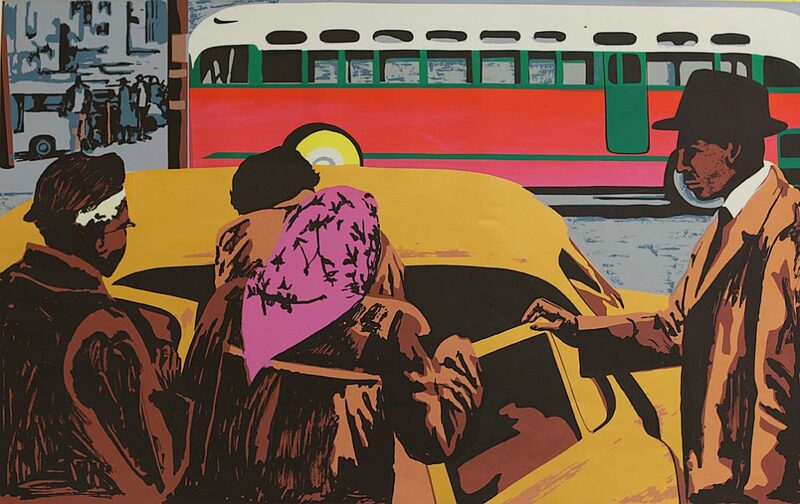 The reiterations of resistance and the carving out America continue throughout Jackson’s work, for instance, Historical Materialism: Carpooling and Breaking the Fast, 1969, give us insights to moments of power and agency. 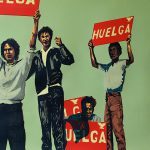 These two prints showcase hxstories of Boycotts where Black and Chicanx communities organized as a means to be seen as human beings because America has not always looked at their experiences as such. 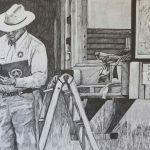 This concept can be traced back to the first-contact of settler Europeans in the Americas, extending into the trans-Atlantic slave trade, and the implementation of nation-state borders, which created genocide and institutional racist structures. Institutional racist structures, where migrants, people of color, the working class, and those labeled as the marginal of society were (and continue to be) seen as products in the agricultural chain, the supply industry, the labor force, etc.v Arrival 2, XICANX/Citizenship: Arrival, and Bracero Living or the Concentration Camp recap the life that Mexican workers who participated in the bracero program underwent from 1942-1947 in primarily agricultural labor contracts.vi Upon arrival, braceros were taken to processing centers where they were stripped and searched and then sprayed with DDT by Department of Agriculture. 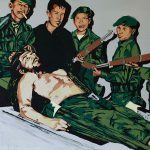 These long hxstories of exploitation and atrocious working and living conditions were met with opposition and ultimately strikes. 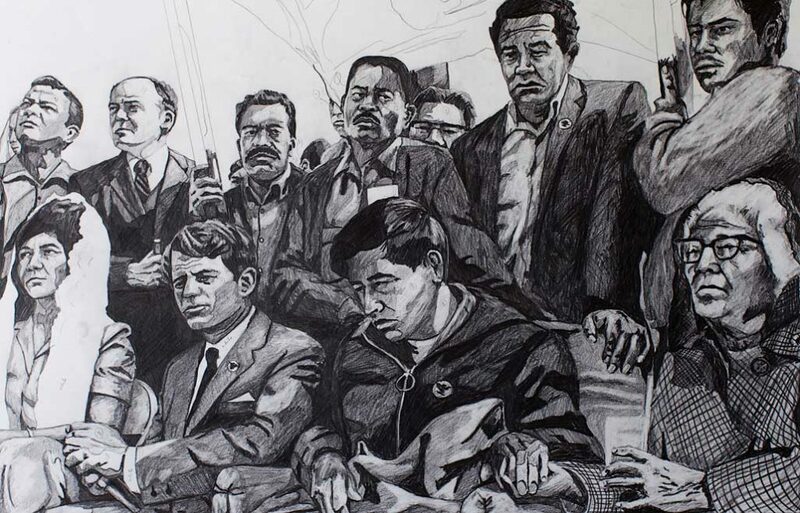 Often overlooked, but shown in Jackson’s Breaking the Fast, 1969, is the Filipino community, who took the first role in leading the strike against growers in the summer of 1965, demanding that their wages be increased from $1.10 an hour as well as demanding better living conditions.vii In Carlos Jackson’s screen-print we see Cesar Chavez preparing to breaks his 25-day fast in Delano, California. The fatigued Cesar Chavez sits with Senator Robert F. Kennedy, his wife Helen Chavez and mother Juana Chavez. Often cut out of the frame, but shown here behind Chavez and flying the U.F.W. 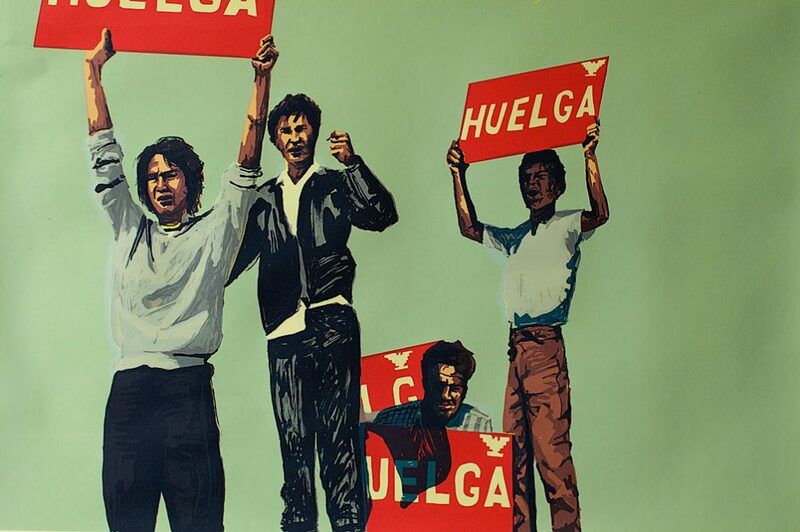 flags are Irwin DeShetler, Andy Imutan, Larry Itliong and Philip Vera Cruz, all major organizers who joined forces with Mexican field laborers in the fight against exploitation and abuse. 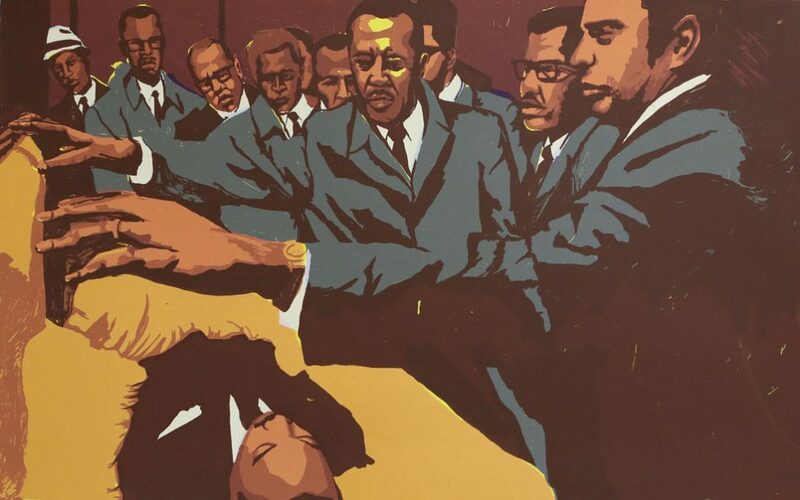 An understanding of this hxstory allows the viewer to gain a new perspective on unity. Jackson’s images remind many of painful struggles, but many forget that it was not done alone; these communities made each other stronger. 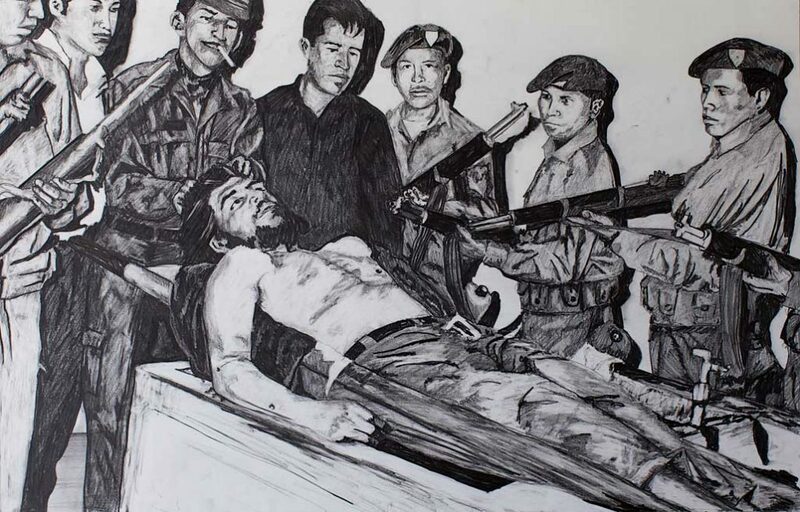 Filipinos farmworkers introduced “Isang Bagsak” to the U.F.W. 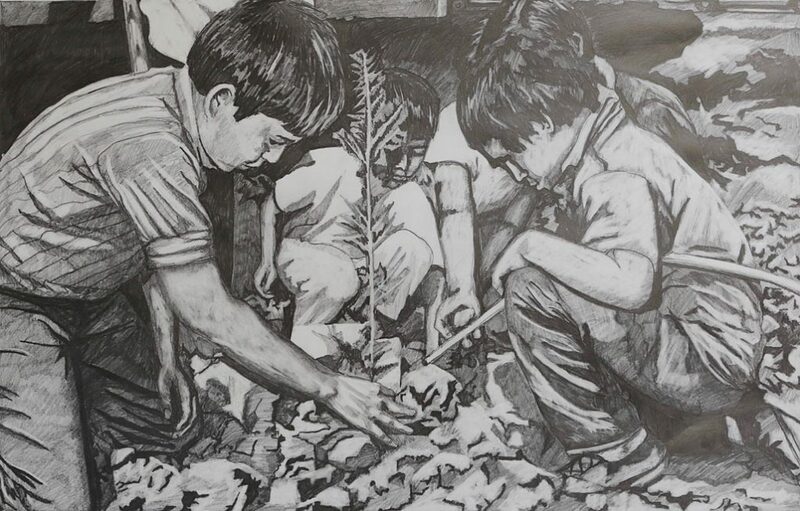 a phrase that means “one down, one fall.” A visual retelling of these narratives allows for the viewer to gain a further understanding that alone change is hard, and if one falls, everyone falls, but that together change can be achived. 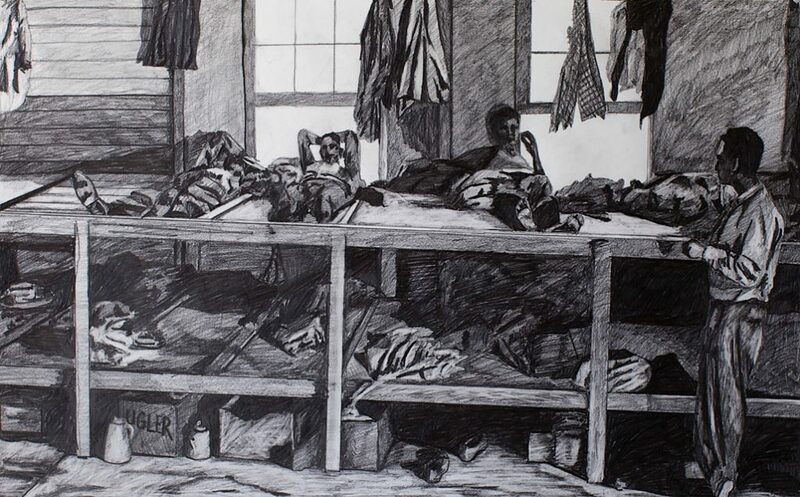 Jackson’s inventory in moments in hxstory are a testament that one is never alone in the struggle; his work demonstrates that the foundations towards liberation have been set and that we have nothing to lose but our chains. 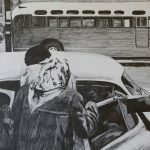 Before Boycott was used as a tool towards liberation in the West coast it was used by Black America in the south, as seen through Historical Materialism: Carpooling. 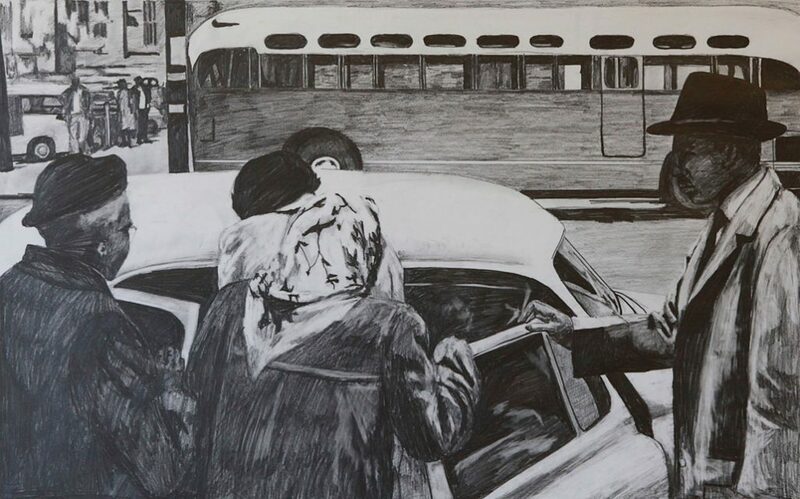 In this print, the viewer is given an insight into the mid 50s where three womxn and a man are entering a cab while an empty bus appears across from them. This moment which we see is alluding to the bus strikes between December 5, 1955 to December 20, 1956, where Black people were engaging in the struggle to end segregated seating in Montgomery, Alabama. Once again, these fundamental images remind us that defiance can serve as a tool against the tyrannizing forces today and remind us that everyone in America today is of value regardless of federally recognized citizenship. The bus boycotts are lived testaments that showed America that the Black experience was composed of people with families, with histories, with culture, with aspirations and with dreams that deserve to be respected and lived. Jackson proposes that “in order to know who we are, we first need awareness, which comes through education, and the only education that can produce this knowledge as a liberatory form is governed by praxis; action and reflection.”viii The creation of Black Lives Matter builds upon this vision, and reminds us that a reformation of America is needed. To reckon with hxstory, the viewer must educate themselves and hold America accountable for slavery, segregation, Jim Crow, lynching, and the mass incarceration of Black individuals. The viewer must then sit with these hxstories and connect them to the genocide of Black bodies in the hands of police departments and grand juries convening across the U.S. 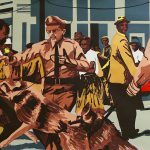 Remaining in the hxstory of resistance, Jackson’s work continues to reckons with instances of state violence in relation to protestors. 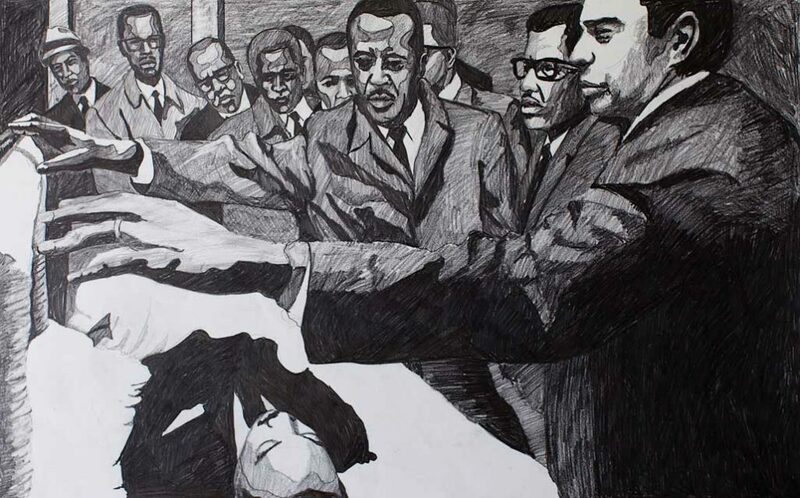 Workings of the State Apparatus: Walter Gadsden being attacked, Birmingham Alabama, May 4, 1964, references The Birmingham Campaign, which was composed of a series of lunch counter sit-ins, marches on City Hall and boycotts on downtown merchants to protest segregation laws in the city.ix In Jackson’s print we witness a case of a reoccurring practices, where peaceful demonstrators were met with violent attacks, high-pressure fire hoses, as well as police dogs. 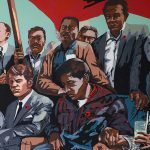 This moment is considered to be “one of the major turning points in the Civil Rights Movement and the ‘beginning of the end’ of a centuries-long struggle for freedom.” x Likewise, The workings of the State Apparatus: August 29, 1970, tells the hxstory of protestors in East Los Angeles. 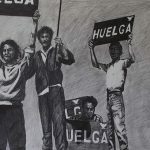 On August 29, 1970, the National Chicano Moratorium Committee organized its first public demonstration to protest the war in Viet Nam in East Los Angeles, where 30,000 attended the demonstration in a display of solidarity. The march culminated with speeches and festivities at Laguna Park and despite peaceful rally, the Los Angeles Police Department opened fire on activists, families and children, using “non-lethal projectiles” and tear gas. Police officials alleged that a liquor store had been broken into and that the robbers fled into the crowd. 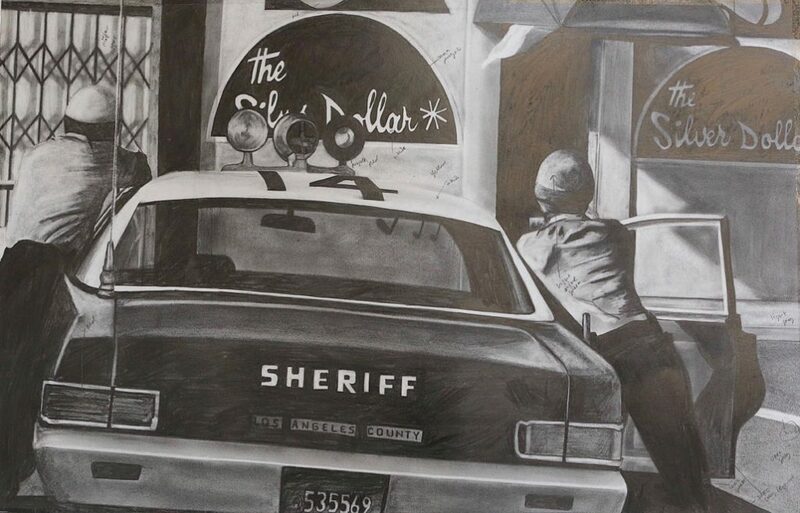 As families scattered, innocent community members were beaten and arrested, during the ensuring riot, police shot a tear gas projectile into the Silver Dollar Bar, where a group of people had sought refuge from the violence. Ruben Salazar, a columnist for the Los Angeles Times, was hit in the head by the tear gas canister and killed. By the end of the day police had killed three people and injured more than sixty other individuals. 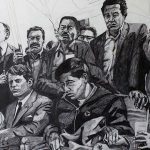 Ruben Salazar’s image and events at the Silver Dollar Bar had become emblematic of the moratorium’s tragic end.xi Workings of the State Apparatus: Walter Gadsden being attacked, Birmingham Alabama, May 4, 1964 and The workings of the State Apparatus: August 29, 1970, visually elaborate the lengths to which the American government and law enforcement agencies were willing to go to crush peaceful dissent and protest. 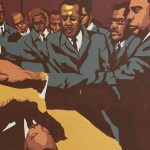 In these prints, Jackson is asking the viewer for communal remembrance; a note to never forget or underestimate the extent to which institutions, local or federal, will go to in order to keep their power and privileges in place. 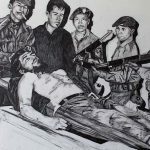 The measures which the American government has taken to keep its dominance can always be taken one step further, as can be seen in The workings of the State Apparatus: Martin and The workings of the State Apparatus: Ernesto Guevara, Age 39. 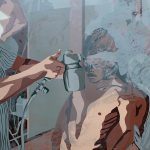 Although, the viewer will want to move past these works because of content, the viewer must reckon with the distaste and impulse to turn away. While these works bring sorrow, they also highlight the radical power that an idea of different worlds being possible holds. 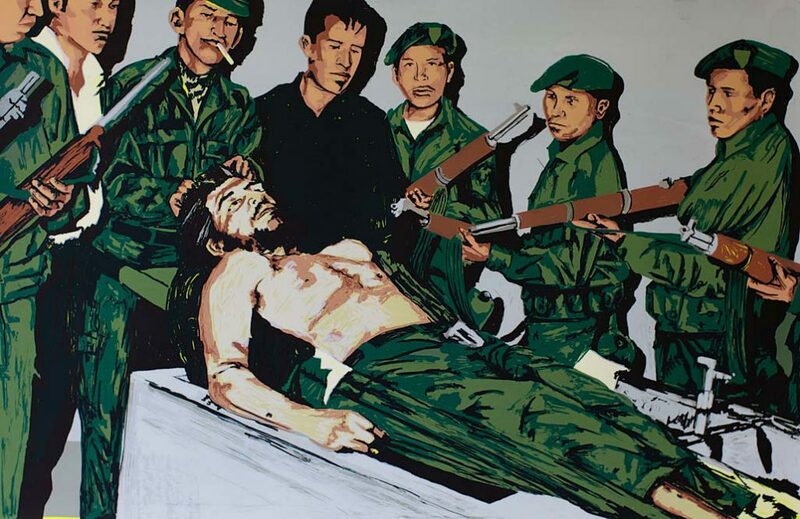 American empire played a role in attempting to extinguish the flames of hope and change across the world through the murders of Martin Luther King Jr. and Ernesto “Che” Guevara. 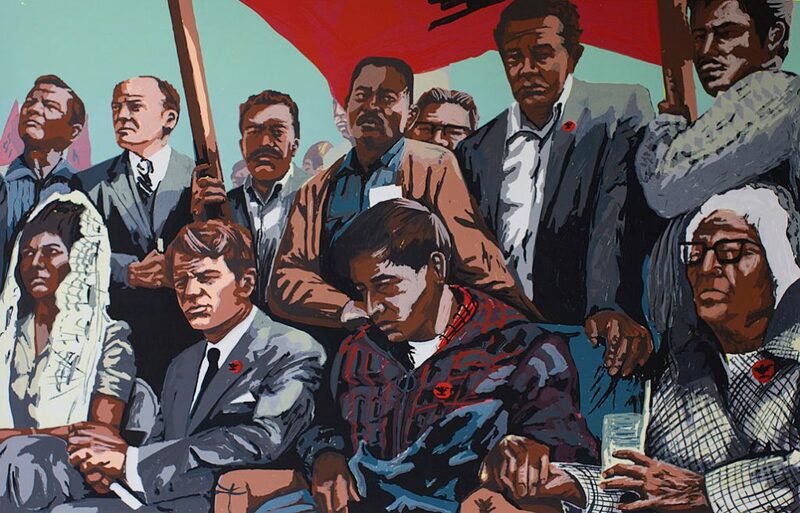 Jackson inserts these images to continue communal remembrance, but also to signal that ideas of a different world will be seen as a threat, and that those in power will use all their resources to extinguish any change that does not uphold their power. 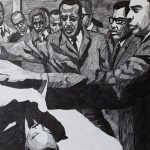 But Jackson is also presenting us with these moments in movements to remind us as Fred Hampton said, “You can kill a revolutionary but you can never kill the revolution.” Thus, reflection of these images can serve as a collective consciousness on the way to seeing that there are multiple ways of being and doing the work, so long as it keeps the revolution in process. 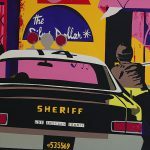 Carlos Jackson’s work will carry the open wounds of injustice, sometimes imposed on by institutions and other times by community members that were utilizing the master’s tools to oppress their own community. 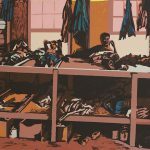 Each print will ask the viewer to bear witness to the hurt and exclusion, but each print also carries a redemptive quality if the viewer is willing to “winnow out the lies.” This is the nature of Carlos Jackson’s work; it is an invitation to those who want to embark on the journey towards decolonization. Now is the time for the viewer to readjust their own views and seek the truths, there is no direct answer as to how to do this and no direct end because each individual governs a different path. Jackson’s work has done its part in creating new symbols, new forms of hxstories, new perspectives or/and ways of seeing ourselves in the world. 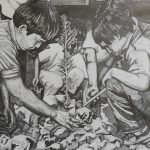 Just as the children in Drawing for Xicanx Park, April 1970 that plant the seeds for a new space that will hold their hxstories, truths, and visions of the world they wish to see, we too must begin to carve out the space we envision for Nuestra América sin fronteras, sin miedo y resistiendo. iv Anzaldúa, Gloria E. ibid. 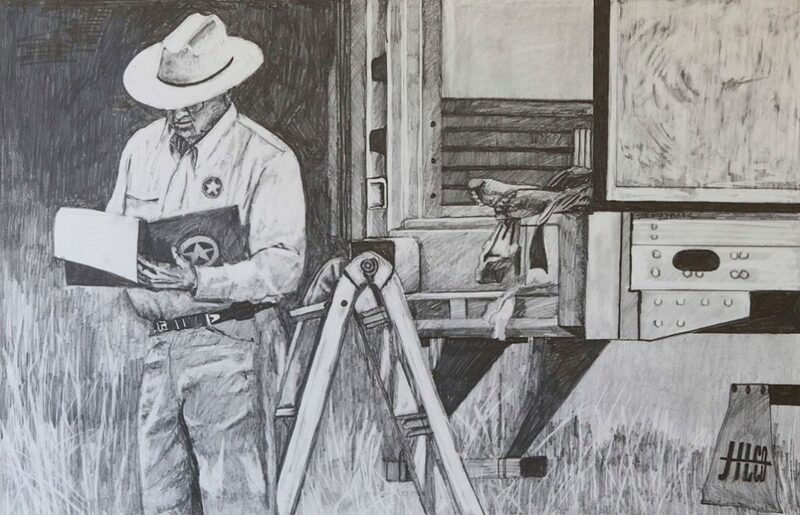 109.
v See print by Carlos Jackson’s Victoria, Texas, May 13, 2013.
viii Email exchange with Carlos Jackson on 9/13/2016. 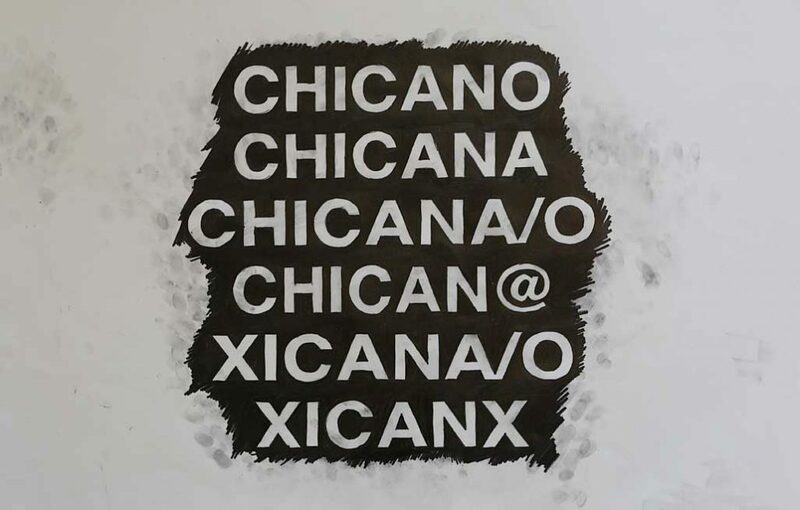 …Chicanx posters demonstrate that Chicanx identity is fluid, in development, and open for creation, a finding that contests the widespread notion that Chicanx identity is a fixed category that is manifested in predictable ways. 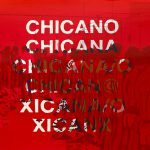 Carlos Francisco Jackson is an associate professor and chair in the Department of Chicana and Chicano Studies at the University of California, Davis. 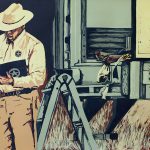 He received a BS in community and regional development and an MFA in painting from UC Davis, and he was awarded the Robert Arneson Award for excellence in the MFA program. 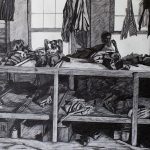 He has been a fellow at the Skowhegan School of Painting and Sculpture in central Maine and the Fine Arts Work Center in Provincetown, Massachusetts. 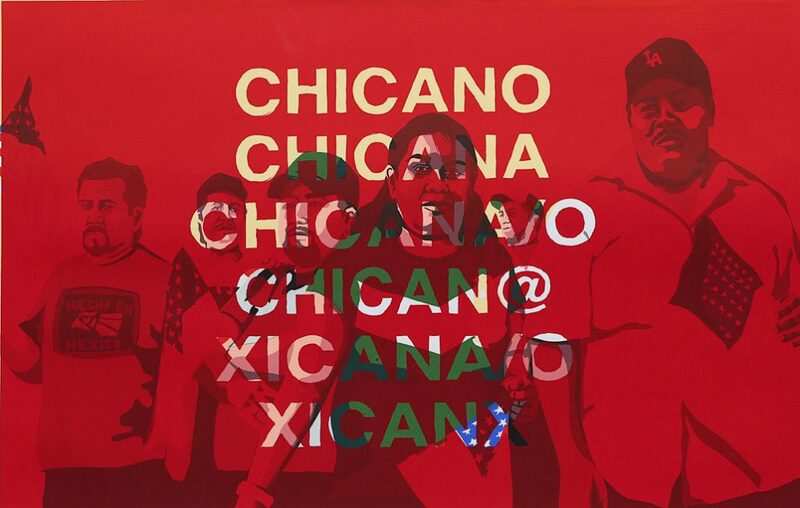 Between 2004 and 2015 he served as founding director of Taller Arte del Nuevo Amanecer. 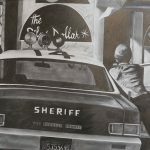 Jackson has shown his art at exhibitions throughout the United States. 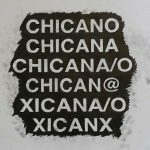 He is the author of Chicana and Chicano Art: ProtestArte (University of Arizons Press, 2009), and his work appears in the exhibition catalogs Mi América/My America: Carlos Jackson (University of Illinois, 2011) and Estampas de la Raza: Contemporary Mexican American Prints from the Romo Collection (University of Texas Press, 2012).